Like most Architecture students at UTA, I took photography. Back then it was a still photography. I spent both many hours in a dark room and a lot of money for the supplies. After graduating, I rarely took photos. In 2006, one of my friends introduced me to Flickr, which is an image-hosting website and online community owned by Yahoo! It is a popular website for users to share and embed personal photographs. I casually joined and got myself a DSLR. To my surprise Flickr turned out to be a very supportive community. It is basically a social network for advanced photography enthusiasts. There are various groups not only to share photos but take a part in discussions. Some of the groups are used by bloggers to host images that they embed in blogs and social media. I have had numerous photos featured in the NPR picture show, Art&Seek by KERA, and archidose by John Hill, which is a popular architecture blog site. Originally I never liked the idea of switching to digital in spite of how convenient it is. The result was never same. Besides, I realized that the most beautiful digital photos on Flickr were the ones in which the photographer spent a lot of time on Photoshop trying to not make it look like a digital photo. The quality of image, depth of colors, or just the mood the film image creates is far superior to digital. I have come across so many captivating inspirational photos by film cameras on Flickr that it gave me an analog aspiration. I now own a few medium-format film cameras. Medium-format is a film size. The film format is called 120 (60mm wide) and it is a rolled film. The brand names — Kodak, Ilford, Fuji , Lomography — can still be purchased online. In Dallas, a couple of stores still develop medium-format films. I have Holga and Hasselblad, both of which come in square frames, which I love. I purchased a used Hasselblad 500C/M from a local photographer, who switched to digital. It came with the body, film back and 80mm lens. Hasselblad is made in Sweden using a German-made Carl Zeiss lens, which is widely used by professionals. Perhaps the most famous use of the Hasselblad camera was during the Apollo mission, when man first landed on the Moon. What I like about this camera is not only the exquisite design of body, superb optics, large viewfinder, and loud shutter sound but also the particular the shallow depth of field. The soft focus gives the images an ethereal feel. My Holga is pretty much opposite. It is a well known as a toy camera, with a plastic body and plastic lens made in China. It is simple to use, the shutter speed is fixed, it has one effective aperture, and basic focus. The images are unpredictable until I develop the film. The aesthetics of cheap plastic construction fail in many areas. On this black and white image of my daughter taken at the Modern in Ft Worth, I have a missing area on upper right corner because of the light leak. The images display a vignette, blur, light leak and other distortions. This is typical characteristics of the toy camera. Then again I love how the image appears to look a lot like an old, restored photo. 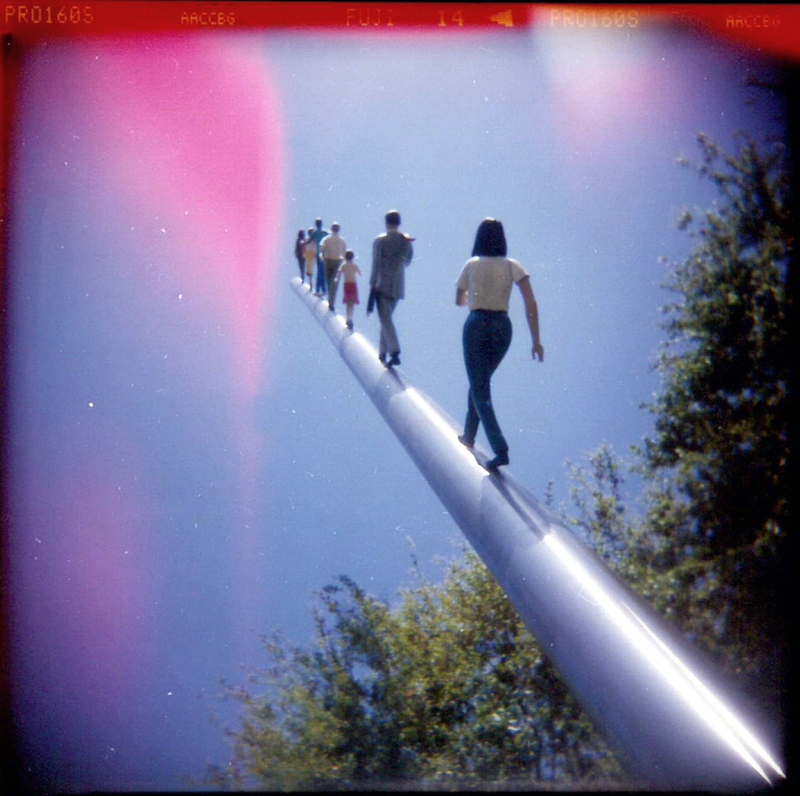 This is a color image of a sculpture called “Walking to the Sky” by Jonathan Borofsky at the Nasher Sculpture Center. It was such a sunny day. Light leaked from the back of a red window, giving the image a surreal look. I occasionally use a texture merged with a digital photo to express a different feel. I recently bought a Holga wide-angle pinhole camera. The size of film doubles to 12×6. The look is timeless. Double exposures or any number of exposures can be done. Actually, this was a happy accident. I did not know until I developed the film. Working with film creates both anticipation and unreliability. Those problems became a virtue for me. Since I wasn’t familiar with the medium-format cameras, Flickr was my source and inspiration. I increased friends through Flickr all over the world, including from my home country Japan. If any of you would like to see those cameras, film or print out, just let me know and I would be happy to show you. Your start in the dark room, developing your own films, must have thrilled you. We all have our nostalgic side. Me as well, but to me the dark room felt pretty claustrofobic and the sour smell wasn’t nice either. But true: the magic of slowly seeing the image appear is hard to beat. Few of us went into color processing – too complicated – so we had to wait how things had turned out. Some good, most of them bad: the beauty and the downside of unreliability. I prefer digital processing, because I am the boss, the workspace is always pleasant and no ugly smells. What I don’t get is the Hasselblatt – Holga comparison. The Hasselblatt is a true gem of a camera, expensive and ranked among the very highest, with excellent control when you know what to do. 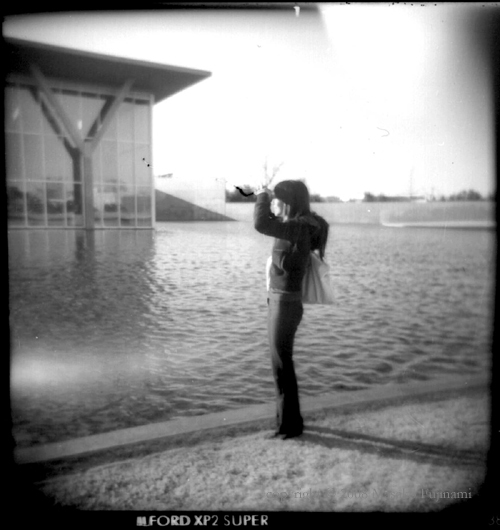 The Holga is cheap and fashionable but in fact ranked among the lowest because every shot is more or less an accident. Funny perhaps, but to me a sign that the photographer is not serious. I don’t mean that in a technical sense, I simply don’t see the point of liking a wild out of order result (as a rule). You must a adventurous mind, Masako. Ahhh, the happy accident. Very nice. 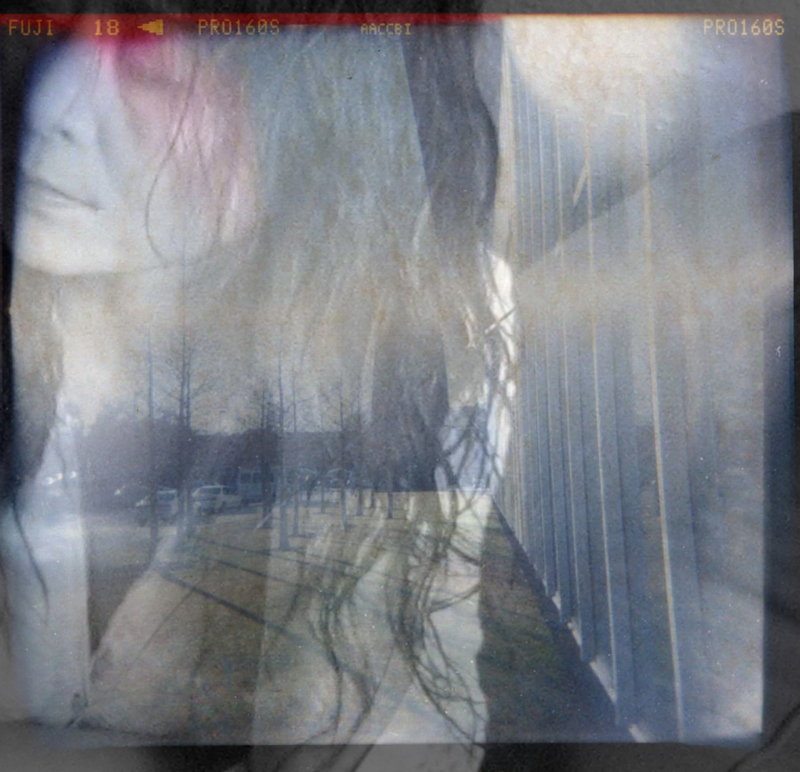 As a student, I fondly recall shooting a series of double exposures on a 35mm SLR. Just the act of shooting the film, then rewinding the roll (but not all the way) in order to re-spool and re-shoot- the familiar click of the film end- these things were all an inherent part of the process of shooting photographs. I can also recall the heartache of losing an entire roll of shots as someone opened the door to the darkroom just as I was transfering a roll to the development reel (lesson learned – always lock the door to the dark room). To my dismay, it seems the instant gratification of the digital era of photography has inherently taken away some of the more discreet pleasures of taking photographs. Thank you Masako. It is so important that architects use their brain’s “lens” to view the world in different ways. “Happy accidents” are worth their weight in gold… they can occur in our daily life and work if we let them happen . They keep us nimble and open minded. So glad you put these on a blog. Congrats. So enjoyed the review of your history with photography, Masako! It is so like you to both deeply appreciate the Hasselblad at the same time you find delight in the Holga! Your own work is a musical arc between the tightly achieved and the playful. And it’s the best of mornings when we can pour a hot cup of coffee and look at your pictures! I have always loved your passion for film photography. It is something we share in common and have talked about over the years and of course I love that we have two of your wonderful holga shots hanging in our living room. You know that I shoot both digitally and with film but more and more I use film, especially when shooting black and white. Shooting in film always fills me with excitement and anticipation of seeing what I captured on those frames. It is also an exercise in patience and self-kindness, a continual learning process. Film photography helps me keep a sense of wonder and experimentation. I am continuing to try new things (or sometimes antiquarian) just to see what will happen. I love that you enjoy the sense of play that happens when using the unpredictable Holga and at the same time appreciate the beauty and thoughtful design of the Hasselblad (my favorite camera too!). Going back to film has made me even explore further the history of photography. I enjoy printing my own black and white photographs but have also, in the past two years, returned to historical processes using alternative means. I can tell you it is an incredible thrill to hand coat paper with light sensitive chemicals, contact print on a rooftop in New York and watch that image come to life knowing you were part of the entire process. I really enjoyed reading your post about your love for photography and it is always a joy to view the world through your eyes. I find the creative process of photography to be a very nice change of pace from architecture. It allows me to explore the world without trying to change it directly, it is only through passively seeing the world that a photograph is created. Your images are very inspiring because they show how you envision the world and move through it, Masako. I really enjoyed hearing about the history of how you came to photography and why. I also enjoy the Holga for the same reasons you stated. It gives you a certain constraint of technicalities while also freeing up how you take the photo. Instead of worrying about f-stops and shutter speeds you can just point and click. The resulting image becomes its own creation and therefore provides a feedback that is totally different from something like a hasselblad. Exploration is a necessary step in the creative process and I find that any serious photographer should strive to do something that others have not. That is why I appreciate your point of view and how you approach photographing your world so much! Thank you so much for including me in this, Masako. I learned so much about you in this. I didn’t realize you were so devoted to film and I never realized how the Holga was such a creative part of what you do. This is very well done. I’m a big fan, as you know and enjoy all your work. Great work Masako. I’ve always loved the self portraits. I too miss the film days and the smell of the darkroom plus the creativity. Great blog. Thank you for the invitation. Hi Masako, I love the freedom available with digital. I work on the road and have my camera near me as I travel. You never know when something wonderful will magically appear. That is the real accidental magic to me. It is a nice memory that I have worked in a darkroom but I far prefer the digital world in that I can quickly review my work and in short order find the best shot and share it with family and friends. Accidental is cool, but controlling more of the photographic variables is, to me, better, and then the accidental magic is what is happening in the real world which you don’t control. I think many old school pro photographers miss the days of chemical darkrooms because the barriers to entry are so high that amateurs can’t take work away from them. I’ve enjoyed your work for a while now. At times, architectural photography can be somewhat cold and detached, but you seem to manage a way to bring out the qualities of life and vibrancy and character in your work. I am glad you had the experience of analog photography. I think at some point everyone should attempt it, even if they don’t continue. It does open up a new way of thinking and doing, which can only benefit the process. Good luck with your work, and congratulations on a fine blog post. It would be nice to see more.